Tektro 'Io' mechanical disc brake; not so bad after all? What's in a name, eh...? Io is the name of one of Jupiter's larger moons (first spotted by Galileo) as well as in Greek mythology, the name of one of the goddess Hera's priestesses, whom Zeus unfortunately turned into a heifer for some reason. Quite what any this has got to do with a disc brake is anyone's guess, but Io is also the name of one of Tektro's more basic mechanical disc systems, commonly found on workaday fodder such as various Carrera bikes including the Subway disc models for at least a decade. So is this brake an out-of-this-world stopper or -being slightly unpredictable and overweight perhaps- more of a, er, heifer? I should mention that I have owned used and/or worked on about a dozen sets of these calipers and they have for the most part just worked. Not always brilliantly, admittedly, but I can put problems down to rubbish pads/cables and/or contamination/bent discs in most cases. Finally I have got around to stripping one of these calipers down; below I describe what I found. Tektro Io calipers; basic but effective? First impressions are not enormously favourable; there is a brake arm which lacks any radius for the cable to wrap round, which means the brake MA (mechanical advantage) will vary slightly through the stroke, and the cable may eventually fatigue near the pinch bolt. The brake also looks a bit of an awkward lump by comparison with (say) a BB5 caliper. The caliper body bolts directly to either a post mount or an ISO adaptor, and there is no sign of provision for anything other than slight lateral adjustment; there are no caliper positioning (CPS) washers as found on BB5 and BB7 brakes. The main adjustments are to the cable (eg using the barrel adjuster) and via the fixed pad adjuster (FPA) which uses a 5mm key. However appearances can be deceptive; the complete caliper (including pads, all bolts and ISO adaptor -large rear 160 type as in the photo- ) weighs 244g, which is only about 12g more than the aforesaid BB5. And when the caliper is stripped down, you can see why there are no CPS washers or similar; they aren't needed. Both the pressure foot (PF) and fixed pad foot (FPF) have an articulated endpiece which bears against the brake pad. In the case of the PF, this both allows articulation (so that the brake pad always self-aligns to the disc) as well as allows rotation, so that the moving piston can rotate independently of the PF. Both endpieces can articulate about 3 degrees (they are fully offset in the photo); more than enough to allow for any reasonable caliper misalignment and any reasonable angled wear in the brake pads themselves. The articulation is based on a large spherically curved seat, estimated at about 15mm radius. The movement is spring preloaded (in such a way that I couldn't see how to disassemble it easily) so that a substantial pressure is required before the articulation will reset. This means the brake pads are unlikely to move/reset accidentally. The PF is actuated by the usual arrangement of three balls (in this case 7/32" diameter cf 3/16" in many others) on ramps. Unlike Avid BB calipers, the shaft of the moving piston is a fairly close fit in its bushing. When new this lot is lubed sparingly with a MoS2 paste lubricant; in this well-used brake the lube was still evident. Like BB series calipers the spring provides both return spring torque and axial preload on the balls and ramps. There is a spring preload adjustment grub screw (2mm key) in the caliper body; this adjusts the torsion preload independently of the axial load. There is another grub screw (2mm key) which can bear against the two flats on the moving piston shaft, where the brake arm mounts to it. This is a (poor) attempt to make up for a fairly sloppy fit between the brake arm and the shaft. The pads are retained not by springs (as in most other disc calipers) but by magnets set into the foot endpieces. There are two small neodynium magnets set into each one, slightly underflush. When in good condition these provide enough force to retain the pads in position quite well. 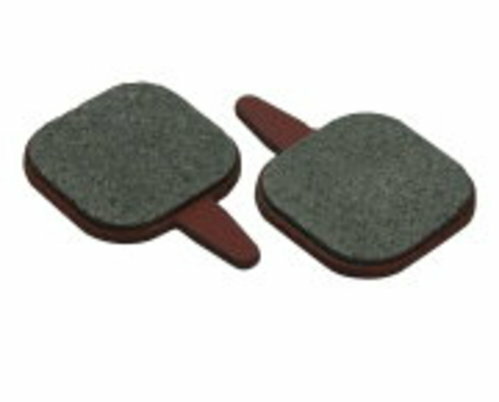 However they can lose force two main ways; most brake pads create iron dust and this dust can cover the magnets, shunting the field away from where it is needed. This can be overcome by simply cleaning the parts eg when the pads are changed. The other main way the magnets can fail is if they become demagnetised. This will happen if the brake gets above a certain temperature, and the loss of magnetism is permanent rather than temporary. It isn't known what temperature this occurs in these particular magnets, but in Nd magnets it typically varies from ~100C to ~200C depending on the grade of material used. Now, it seems very likely that on a long descent the brakes will easily get hot enough to cook the magnets, so maybe this is the achilles heel in these calipers. Certainly I have seen other calipers with (less good?) magnets in them which have mysteriously weakened, but not these (yet). This also means that (unlike pretty much every other mechanical disc caliper) I wouldn't recommend that you use sintered pads in these calipers; they conduct the heat many times faster into the pressure foot assembly, and would more easily cook the magnets. So organic/semi metallic pads only, or other pad compounds that don't conduct heat well. The FPA uses a ~M11x1 thread and is deterred from rotating accidentally by both the magnets and some kind of soft threadlocking on the FPA threads. If the threadlocking fails (as it surely will, in time) the threads can be made draggy again by using a little PTFE tape on them. To change the pads, it is not normally necessary to split the caliper halves; the caliper body gap is ~4mm at the 'exit' (of the disc as the wheel rotates) and almost 6mm at the 'entry'. This allows pads in and out of the caliper entry once the brake disc is no longer in the caliper gap. It also means that even very worn pads shouldn't eject from the exit gap, but might come out of the entry I suppose if you apply the brake with very worn pads when wheeling the bike backwards. Note that it is possible to wear these pads down more than in many other caliper designs; there are no springs to tangle with the disc when the friction material is half-worn. It isn't a smart idea to deliberately wear pads to the death, (since the remaining friction material may spontaneously part company with the pad backing when it is very thin) but you could wear these pads that far if you wanted. Organic pads wear a fair bit quicker than sintered ones, but maybe that is compensated for by being able to wear another 0.5mm off these pads if necessary. Pads are identical left and right, and if they wear with a slight taper on, can be swapped left for right when half-worn, to even the wear out. There are two 'tektro' branded M6x1 threaded 10.9 grade capheads which hold the caliper halves together. These have captive washers a bit like the bolts that are fitted to many handlebar stems. They have ~22mm of threaded shank available. I would imagine that slightly longer bolts could be fitted if the female thread is tapped full depth in the LH half of the caliper body. If these bolts are disturbed it isn't a bad idea to use threadlock on them during reassembly. The barrel adjuster on the caliper body isn't quite long enough to allow for a full pad life, so the cable has to be reset in the pinch bolt or an additional barrel adjsuter (eg on the lever) needs to be used. The standard barrel adjuster also doesn't have any locking mechanism; you can see in the photo that I have added a spring to the dismantled caliper. Now there is one significant quirk remaining in these brakes: Back in the far mists of time discs were often 165-22 or 165-20 sized, i.e. they were 165mm OD and had a track width of 20 or 22mm. Hope C2 and Giant MPH brakes were made this way; both common MTB stoppers 20+ years ago. BB-series brakes originally used 165mm discs too. However over time things have changed; currently shimano make 160-15 and 160-16.5 discs and these sizes are used by a lot of other brake makers too. So no surprise then to find that Io pads have friction material which is meant to engage with a ~17 mm brake track on a 160mm disc. In fact these brakes are most commonly seen in conjunction with a 160-18.5 disc, which presumably allows for a little leeway in position. However you can see that the friction material is not centred over the pad backing. Nor is it centred over the pistons, either; in fact the calipers are positioned on their adaptors so that a 165mm disc will fit in them without clashing and if only the friction material were more extensive, they would work with 165-20 or 165-22 discs, which is presumably how they were originally intended to be used. The pad backings that fit these calipers also fit Tektro Gemini, Tektro Novela (pre 2009) and some promax calipers (amongst others). If you go to buy Gemini pads, many of these have a wider, non-offset block of friction material. These can work in Io calipers with 165-22 discs or can be modified (by grinding the friction material away) to work with 160-15 discs (as can Io pads in fact) or 160-17 discs with piston-centred friction material, provided the caliper position is adjusted slightly to suit. Note that full size friction material (22mm x 22mm) on these backings gives the same wear area as many other current brakes (eg 16mm x 28mm) but lower disc temperatures and lower pad/disc wear rates because the track width is greater. The mechanical advantage of these brakes is about 17.5:1, i.e. the moving piston moves 1mm for every 17.5mm of cable pull, which matches V brake levers fairly well. If you use adjustable levers (eg avid speed dial) you can fine tune the system MA vs the running clearance of the brakes. It also occurs to me that it would be easy enough to file another slot (the other side of the pinch bolt) to make the brake arm a bit shorter, (reducing the caliper MA slightly) in which case these calipers may work well with NSSLR cable pull (i.e. current shimano road STI and some tektro) road levers on a road/touring bike. The magnetic system in these calipers may in fact withdraw the pads more squarely than in most calipers which have pad springs; these brakes usually rub because the standard discs that come with these brakes are often not particularly straight; with good discs it may be possible to accept a reduced running clearance and use a brake setup with a high overall MA which would be good on a loaded touring bike. So overall these brakes are better inside than I expected, are (with a little fiddling) compatible with a wide variety of discs and with one or to caveats (such as the possibility of losing strength in the magnets) I think they are nothing like as bad as one might expect.